BetBright is a new company on the betting market. The owners made it clear from beginning that they want to stand out from the crowd with a verry own style. It makes it quite interesting one to test. Just as other big players from Ireland, like Paddy Power or BoyleSports, BetBright offers interesting product with number of promotions and nice offers. Apart from sportsbook they also offer a good casino. Our focus got shifted to their offer once we saw how consistent they develop the product. The improvements in streaming (all UK and Ireland racing is streamed), a great development of the mobile product, all this happened this time, but also with a great consistence. We also like the philosophy to really focus on real customers, so BetBright includes some measurements to ensure the number of fake accounts and bonus abusers are as low as possible. What first looks extreme, will help the company to give more to the real players. Not a bad way. Keep on mind, they will only let UK and Ireland customers sign up! Betbright might only have been founded in Dublin in 2012, but they are a bookmaker whose stock is rising fast. Not only do Betbright cover a wide range of sports, they also provide gaming opportunities with Virtual Sports and a Live Casino. They try to cater to the needs of every punter. Below you can find everything you need to know about the services they provide in our Betbright review, and hopefully we can help you decide if Betbright are the right bookmakers for you. Min deposit 20. Max sports bonus £20. Max Casino Bonus £30. 5x wagering to release sports bonus. Min odds 1.80. £30 casino bonus added within 24 hours of forst sports bet settling. 40x wagering to release casino bonus. Betbright is focusing a lot on UK events including horse racing. No surprise that they have came up with an interesting welcome free bet for new customers for Cheltenham Festival. They are now offering a £100 free bet for a limited time. In order to get your free bet you need to register and deposit at least £10. Then you should place your first bet with odds of 1.66 or more. Once done the bookmaker will refund 50% of your bet stake if lost. Maximum free bet is £100. Betbright offer a fantastic £50 sign up bonus to new online customers. It really is very easy to avail of this brilliant offer, and all you need to do is sign up and open a new account. Once you do this, simply place a bet of at least £10 and, if your bet loses, Betbright will refund 50% of your losing stake up to a maximum refund of £50. The odds on your first bet must be greater than 4/6 for the bonus to apply, and it does not apply to SP (starting price bets). Betbright also have a wide range of promotions in their betting markets, and those are updated daily. All of the promotions available at any given time can be found under the promotions tab on their website. For example, if you stake £50 on the ‘In Play’ market in Champions League, you will receive a tasty free £5 bet. That is not the only football promotion Betbright are offering right now. If you like your accas, Betbright will give you a 6th risk free selection on all 5 team accas. The offers don’t stop there either, and if you like to have a bet on the Premier League Darts during the week, Betbright will top up your winnings on any single or acca bets by a whopping 25%. If American sports are more your cup of tea, Betbright offer acca insurance on bets with 4 selections or more. This means if just one selection loses, Betbright will give you your money back. So, if you are looking for a bookie that offers regular, and substantial bonuses, look no further than Betbright. 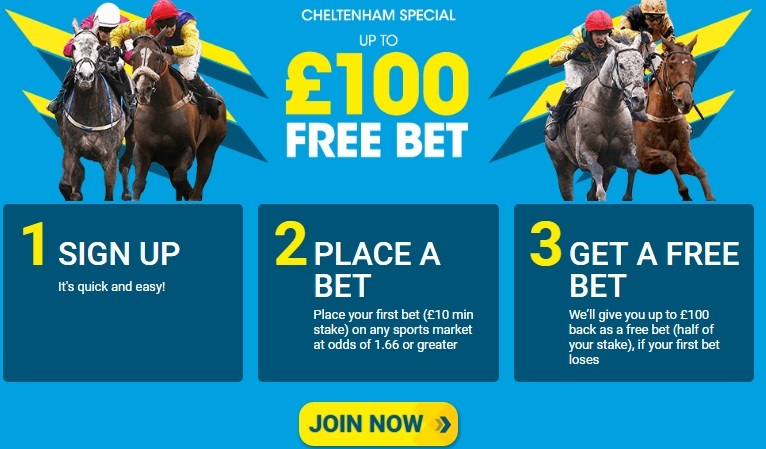 One nice and interesting offer is their reward plan called BetBright Plus. When you register your account make sure you ask their support to join this loyalty scheme! Once youre in, you will start collecting your points. The more you bet, or also play casino, the more points you get. Every Monday they count the points and based on your final amount for week they give you some bonuses or even cash. The smallest prize is £5 free bet but if you play a lot you can get even £1,000 back each week! Betbright offer a huge amount of markets across a wide range of sports. Their main focus is on UK Sports, but they do have a wide range of betting opportunities on sporting events from around the globe. They don’t provide markets on as many sports as some of their industry rivals but what they do cover, they cover very well. They often offer extra places each way for some of the biggest golf tournaments and they have prices on all the major sporting events. Whether you like to bet on Rugby Union, Rugby League, Boxing, MMA, Formula 1 or Tennis, Betbright have a multitude of markets and some of the best prices around. Betbright prides itself on being one of the best bookies when it comes to betting on football. This is one of the biggest markets for bookmakers in the UK and the Premier League is where the vast majority of money is bet. Betbright cover every match, not only in the Premier League, but also at international level and even at semi professional level too. Betbright have got every league and match across Europe covered, and they also cover matches on every continent. There are often enhanced accas available daily on football, and these can be found by hitting the ‘Bright Boosts’ button on the left hand side of the home page. They are competitive on prices, they use their own platform for pricing and, if football betting is your main focus, there are few better choices than Betbright. Betbright is also a superb site if you fancy having a flutter on the horses. They have every meeting across the UK and Ireland covered and if you place a bet of just £1 you can stream the race live on the BBTV. They have rights to show every race, both UK and Irish, unlike plenty of other bookmakers at the moment. For this reason alone, Betbright are worth checking out for your horse racing betting needs. When it comes to betting on horse racing, Betbright keep it simple. If you are happy enough to stick to win and each way betting, then Betbright has you covered. For those who prefer place betting, or betting in other markets like ‘without the favourite’, then you can also get on. Betbright are now sponsoring a trio of horse races at Kempton in February, the big one being the Betbright Handicap Chase. Make sure you check for any special promotions that Betbright may be offering on those three races. Tennis is a hugely popular sport for punters to bet on, and Betbright have all the biggest ATP and WTA tournaments covered. Not only can you bet outright on events like Wimbledon, The US Open and The French Open, you can also bet outright on the smaller tournaments too. If you prefer match betting, you can get all your tennis accas on with Betbright. Not only can you bet on individual matches, Betbright offer a wide range of up to ten markets per match. So, for example, you can bet on who will win the first set, correct score of sets, total games and there is game handicap betting available too. You can also bet ‘in play’ on tennis with Betbright, so when it comes to betting on tennis, Betbright have served up an ace. Take a look at the detailed overview of payment methods supported by this bookmaker. Below you have a list of all deposit and withdrawal methods, currencies as well as processing times. The accepted currency is GBP only. Withdrawals will be processed back to the last deposit method used. Withdrawals take 3 – 5 business days to clear your end. Unfortunately this bookmaker doesn't support deposits nor withdrawals through virtual wallets like PayPal or Skrill. It's a pain for punters that don't own their credit cards. Nothing really you can do about it at the moment. Hopefully they will introduce new payment methods soon. If you have questions to BetBright customer support it's best to use their live chat. You only need to give your email address and name. The customer service team is quick in replays and usually helpful. 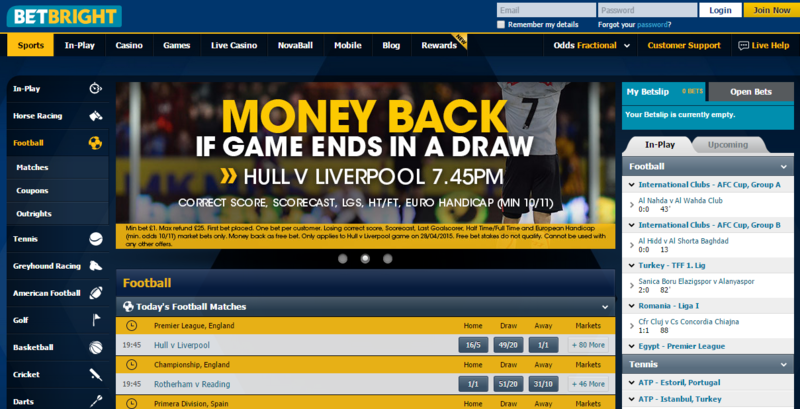 As already mentioned BetBright runs their sportsbook from an own platform. That means they have the flexibility to do things their own way. The navigation on the site is clear and they definitely give a lot of space to promote their offers there. 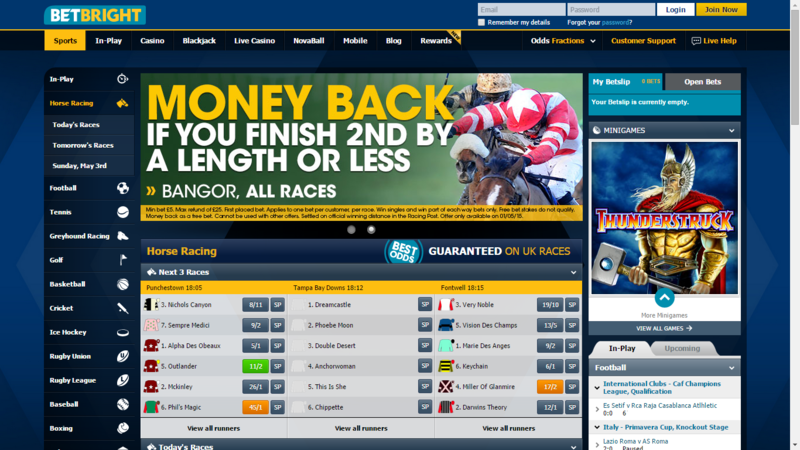 It's easy to find all important parts of the site including Betbright login and customer support. Apart from sportsbook they also have casino, games, live casino, mobile and blog sections. While there is nothing unique about this site it's definitely a decent one that can compete with the best brands. From the users point of view, the Betbright mobile site and app is well laid out and simple to find your way around. The interface is well laid out and the bright blue and yellow interface really stands out and is easy to read. 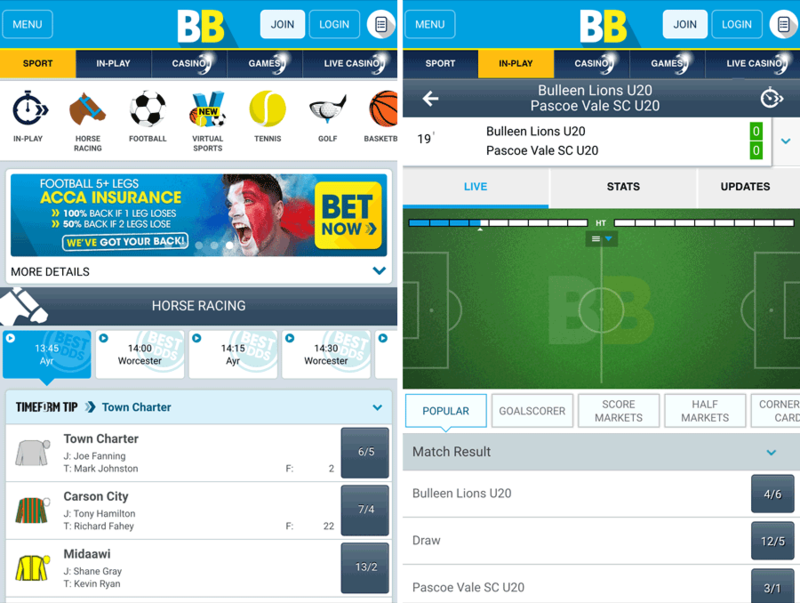 Across the top of the screen you can access the different services provided by Betbright, including ‘In Play’, ‘Casino’, ‘Games’ and ‘Live Casino’. A second menu below shows you all the most popular markets, including football, racing, tennis, golf and also a handy tool called ‘Genius Betfinder’. Betbright describe this as ‘a bet-building tool that helps you to pick from different stats, providing you with selections based on your preferred criteria and eliminates the bets you don’t want’. This is an innovative tool and it can help you separate the wheat from the chaff when it comes to betting on horse racing on your mobile device. On the left hand side is a drop down menu that lists every available sport in alphabetical order. There is no doubting that the Betbright site really is easy to use. The simplicity of it is what makes it so good and when it comes to mobile site and apps, Betbright have one of the very best platforms around. The Betbright mobile site works fine on all devices. The news broke in early 2017 that some UK bookmakers would no longer be able to provide live streaming of race meetings shown on At The Races. That includes races in the UK and in Ireland. Ladbrokes and Coral are two of the highest profile bookies to be affected, but Betbright has the rights to show every race live on BBTV. It is very simple to watch any UK or Irish race live on Betbright TV. All you need to do is place a bet of just £1 on any race, and that is it. Not only can you watch races live on their desktop site, live racing is also available on their mobile app and site too. So, whether you are betting from home, or on the move, you can watch your horse run with Betbright TV. Betbright Casino might not be the most known brand when it comes to this type of entertainment. Yet their casino offering is more than decent. The operator offers key types of casino games including slots, roulette, baccarat and blackjack. Your bonus will need to be rolled over 40 times before you will be able to withdraw your winnings. BetBright is a newcomer in the betting world. They are trying hard to take some market share from the well established bookmakers. They have their own product, lots of promotions and really nice website. It all makes them an interesting bookmaker to give a try. Their new welcome bonus is quite interesting. With only £5 you can get £20 in free bets. It's a good value offer. Taking all into consideration MyBettingBonus.co.uk decided to give a solid 4* (out of 5* possible) rating to this bookmaker. How to use free bet? BetBright free bet offer is pretty easy to use. Just keep in mind the free bet is awarded only if your qualifying bet loses. You will get a 50% back as free bet if you loses. BetBright - is it safe? BetBright is a well recognized brand in both UK and Ireland. It's regulated by the UK Gambling Commission. It is a safe bookmaker to deposit to and place your bets. Through the years of running MyBettingBonus we haven't heard too much bad comments about this bookie. To sum up BetBright is a legit betting operator.